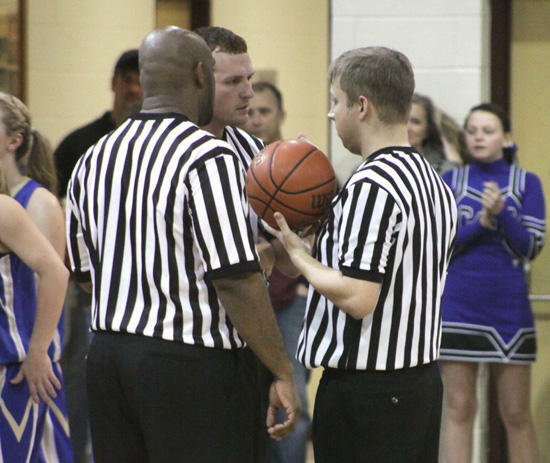 The three TSSAA basketball referees from Friday night's Cannon County, Livingston Academy girls game discuss a controversial call in the waning seconds of the District 8-AA clash at Robert A. Harris Gymnasium. Bailouts have become popular during this economy-stricken era, and Livingston Academy was awarded one by TSSAA officials during a stunning 45-44 comeback win against Cannon County in front of a standing-room only crowd at Robert A. Harris Gymnasium Friday (Jan. 6). Taylor Meadows hit two pressure-packed free throws with four-tenths of a second remaining to lift the Lady Wildcats in a showdown of two of the state's top Class AA teams, which also happen to compete in the always tough District 8-AA. Abbey Sissom had another outstanding game for the Lionettes. The sophomore standout scored half of the team's points with a game-high 22. 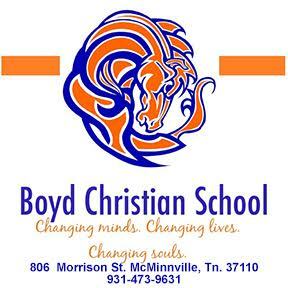 Joanna Young and Ashley Basham each scored eight. Abbey Miller led Livingston Academy with 10 points. Livingston Academy (15-2, 4-0) trailed 44-43 and had possession on its end at sidecourt with 6.7 seconds remaining. The Lady Wildcats ran a play to get the ball to Miller but she was covered and, in desperation, Meadows threw up a prayer and appeared to initiate contact with less than one second remaining. A foul was called on Lionette Lindsey Reed, sending Meadows to the line with four-tenths of a second remaining. After Lionette Head Coach Michael Dodgen called a timeout, Meadows stepped to the line and quieted the loud cheers of Cannon County fans with a clutch game-tying free throw. Her second attempt also was successful to give the Lady Wildcats the win. Meadows only four points came in the final 48 seconds. She had scored a layup with 48 seconds remaining to pull her team to within 44-43. "It was a great high school basketball game and you hate it had to end that way. The official just told me that (Reed) fouled her," said Dodgen, who questioned the game-changing call with less than one second remaining. "I don't have a lot of words. It was two good teams playing and we came out on the short end of the stick tonight. It was a great atmosphere and both teams played a great game." How Livingston Academy ended up with the basketball with 6.7 seconds remaining was just as baffling. Leading 44-43 and with possession, Cannon County (16-4, 2-3) attempted to get the ball inbound to Sissom. It was knocked away and while the ball was rolling on the floor an official whistled Sissom, who was laying on the court, for a foul. After the official slowly walked to the scorer's table, he returned to the lead referee and began what would become a four-minute delay in the game. When all was said and done, Sissom was called for a foul but Livingston Academy did not shoot free throws. Instead, it received the ball on the side even though no player control foul was called. "They said (Sissom) pushed off to get the loose ball and since that was the case and no one had control of the ball there was no free throws but Livingston would get the ball out of bounds," Dodgen said. "I think you shoot the 1-and-1. It's away from the ball but you shoot the 1-and-1. In retrospect I wish they had shot the 1-and-1 because then we would at least have had 6.7 seconds left to do something." It was a sad ending to what had been a classic between quality players and two longtime league rivals. Though the general mood of the partisan Lionette crowd was that referees took over a game that should have been decided by the players, Cannon County did not help itself at the free-throw line. The Lionettes were 8-of-15 from the free-throw line in the fourth quarter and 10-of-18 from the charity stripe in the second half. Reed had a tough night, misfiring on six-of-seven attempts in the fourth quarter, including three-of-four in the final 55 seconds, which is highly uncharacteristic as she shoots 82 percent for the season. "Lindsey is our second-best free-throw shooter percentage wise, and Abbey is first," Dodgen said. "I would take those two going to the free-throw line every time. We missed two many free throws and in a one-point game you can't do that. It came down to free throws. They made their free throws at the end and we didn't. It happens. It just didn't work out for us." The game was intense throughout with both teams relying on sound defense and timely baskets. The Lionettes led 24-17 at the half but Livingston used a strong third quarter, outscoring Cannon County 13-6 to take a 32-30 lead and set the stage for a riveting fourth quarter. Sissom scored nine of her 22 in the final 5:33. Livingston had stretched its lead to 35-30 but back-to-back baskets by Reed and Sissom cut the deficit to 35-34. Young's two free throws gave Cannon County a 38-37 lead with 3:01 remaining. Sissom scored three straight points and Cannon County had reclaimed a 43-41 lead with 1:22 remaining before the unusual ending began to unfold. Basham had a strong night and provided a tough presence in the post. He had seven rebounds and three blocks. Emily Pemberton and Rebekah Faulkner also provided quality minutes off of the bench. "The kids played hard and did everything we needed them to do," Dodgen said. "I can't fault the kids for how hard they played. We played so well defensively. We just have to put this behind us and move on."